Wendy Davis hasn’t said publicly whether she plans to run for governor of Texas, but if she does, her now-famous filibuster will almost certainly help fuel her campaign, not just with notoriety but with cash. According to Politico, campaign finance reports show Davis raised $1.2 million in the six weeks since she stood for more than ten hours in front of the Texas State Senate to block a bill to restrict abortion access (which eventually passed). Most of that cash came from small donors, many outside Texas. “She reported almost 24,000 individual donors — with an average donation to her campaign of about $52. About 60 percent of her funds came from inside the Lone Star State.” Which means 40 percent of Davis’s small-scale donors are sending their cash from out of state. Davis has still got some catching up to do with Texas Attorney General Greg Abbott, however, who’s running for governor as a Republican and already has more than $20 million, per Politico. What he does not have, however, is a pair of nationally famous pink running shoes, and all the high-profile symbolism that goes with them. 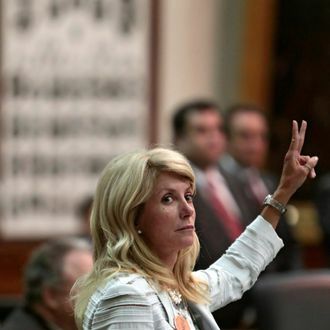 Can Wendy Davis Help the Democrats Crack Texas?